I recently dipped my toes into foreign territory where my 3D Visualisation services are concerned and had the pleasure of collaborating with the Creative Director of The Events Mill to produce 3D visuals for an impending event in London. I can’t reveal too many details about the client, nor the event itself due to client confidentiality but I have been given permission to publish the 3D visuals that I created, based on the design concept proposed by The Events Mill. Sounds serious, right?! But I guess when you’re an established, respected and professional ‘Event Design and Creative Consultancy’ client confidentiality is paramount. So, unfortunately there’ll be no gossiping about the juicy details on this occasion. Sorry! However, I CAN provide all the juicy details of the challenges I faced when undertaking this particular project. I’ve never worked with an Event Design company before but after numerous Skype meetings with the Creative Director, I quickly realised that this was a company that took pride in its professional standing, was forward-thinking, visionary and placed ‘exceed client expectations’ at the top of the list. Soon after our initial ‘welcome and introductions’ meeting, my email pinged with my first ‘proper’ commission. I was given a few details about the client, the event and most importantly the venue. And that’s when the proverbial beads of sweat started to form. This wasn’t a typical venue. It wasn’t the usual banqueting hall in a hotel, nor a Country Club. It was Westminster Abbey. Or more precisely, the Cloisters at Westminster Abbey. I instantly wanted to curl up into the foetal position and bury my head under a pillow and pretend that this commission was a figment of my overactive imagination. But nope, this wasn’t a daydream, this was REAL. And this commission had a nightmarish deadline. Four days. I had four days to produce a set of 3D visuals that accurately conveyed the proposed designs of an event, where the venue was architecturally striking and of great historical significance. Usually when I’ve been tasked with a new commission, I’m provided with a floor plan that includes those all important dimensions but obviously on this occasion that wasn’t an option. 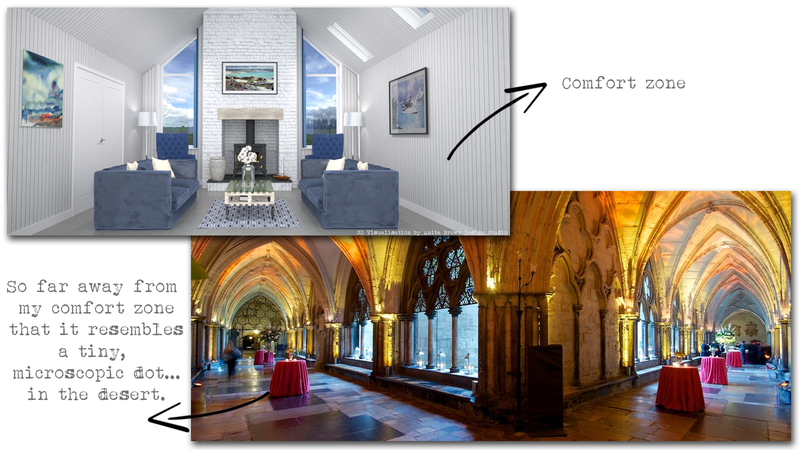 So, having been given my design brief during a Skype meeting I set about familiarising myself with this commanding space via Google Images and researched a little bit of Gothic architecture at the same time. Oh and trying to remember those deep breathing exercises I read about in Cosmo was also crucial at this point. When I was faced with challenges in my previous Interior Design studies (yes, studying Interior Design can have its challenging moments), I always remembered one very important survival tactic: break the ‘challenge’ down into manageable portions. And I applied the same technique to this slightly daunting 3D modelling challenge. To create the 3D model of this structure, I broke it down into segments: the general overall shape, the number of windows, the number of columns etc. I studied the heights of various people/objects in different images of the Cloisters to try and approximate the dimensions of this space and the structural elements contained within it. As you can imagine, this was a little time consuming. Once I had the structure in place it was time to focus on the fun bit: bringing the space to life using the designs envisioned by The Events Mill. I wanted to get this right. I had to get this right. This was my first commission, I needed to prove myself and more importantly my illustrations were an essential visual tool that would help The Events Mill communicate their ideas/vision for the space to their client. I worked tirelessly to get the entire 3D model finished within 3 days so that the drafts could be approved for the final illustrations. I wasn’t entirely sure how my efforts were going to be received but I wasn’t prepared for the feedback I received once the final visuals were forwarded. The Creative Director used the words ‘speechless’ and ‘blown away’ . You can’t BUY feedback like that! And this is why the tears, the one or two (ok, many) expletives and tantrums of 3D modelling are worth it! It gives me great pleasure to share some of these 3D visuals with my followers and readers. Enjoy! Outstanding! You are so very creative. I love it. Thanks Annie! I can’t take credit for the actual design concept but boy, that 3D model was a big ‘un! I love your work, how do you do the animations ? Hi there! Thanks for the positive feedback 🙂 The animations are created using Photoshop and Windows Movie Maker. Usually I have to create many frames (100s) in Photoshop to illustrate various transitions and then I put them all together in Movie Maker.